The American Society of Hematology (ASH) annual meeting is scheduled to take place December 1-4 in San Diego. This is the largest medical meeting in the world that focuses exclusively on research pertaining to blood diseases. Because that includes blood cancers, ASH is a key event for many immunotherapy companies. Meetings like this are where researchers aim to release results from some of their most important clinical trials. For many clinical-stage biotech companies, the ASH meeting can be a make-or-break event. In fact, we have seen important new technologies like CAR-T cellular immunotherapy come to the forefront at past ASH meetings. A positive reception here is critical for companies vying to win over the medical community with new therapies. One topic that has seen exciting new progress and is likely to take center stage at this year’s ASH is multiple myeloma (MM). Multiple myeloma is a cancer that affects a type of white blood cell called plasma cells. These are the cells of the immune system that manufacture antibodies. Antibodies are central to fighting disease because they are designed by the body to recognize a marker (antigen) on the outside of pathogens like bacteria or viruses. The antibody then kills the pathogen or flags it for cells of the immune system to arrive and finish the job. In multiple myeloma, overactive plasma cells will produce one type of antibody in excess, overwhelming the healthy components found in human blood. While some blood cancers like leukemia and lymphoma have seen important new treatments make it to the market recently—such as CAR-T therapies like Gilead’s Yescarta and Novartis’ Kymriah, as well as Amgen’s engineered antibody Blincyto—these have not yet been approved for multiple myeloma. In part, this is because multiple myeloma cells generally lack a crucial cellular target, called CD19, that is employed by these therapies as a method of identifying and attacking cancer cells. However, cancerous plasma cells do express a different target, called B-cell maturation antigen (BCMA), that might fit the bill. New multiple myeloma therapies targeting BCMA are currently under development including CAR-T therapies, antibody drug conjugates, and bispecific antibodies. In this review, we break down BCMA in detail to understand how fundamental differences arise in cancer cells in different types of blood cancer. 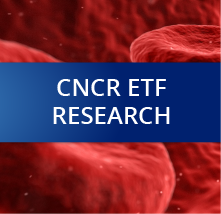 We look at the shortcomings of existing modalities that leave thousands of relapsed multiple myeloma patients lacking treatment options, and explore new approaches to targeting BCMA that are being led by companies in the Cancer Immunotherapy ETF (Nasdaq: CNCR). View all holdings of the Cancer Immunotherapy ETF. Multiple myeloma is simply defined as cancer of the plasma cells. Plasma cells are a subset of a type of human immune cells called B-cells, which are broadly responsible for producing antibodies to maintain a broad range of immune-related activities. Multiple myeloma is not the only type of cancer that can arise in B-cells. Leukemia and lymphoma, two other common blood cancers, which are defined by a unique physiology and differing treatment approaches, can also occur in B-cells. These differences largely result because cancer can arise during different stages in the lifecycle of a B-cell. To really understand these differences, we need to take a simplified look at the B-cell development process. B-cell derivatives migrate to different tissues, such as lymph nodes, where mature B-cells then differentiate into plasma cells. During each stage of the development process, B-cells are characterized by a distinct molecular architecture that scientists call phenotype. Errors in any stage of the developmental process can lead to the onset of cancer, and a different type of cancer will result depending on the stage of development and corresponding molecular architecture when the cancer arises. Leukemia subtypes generally arise in pre-b cells in the bone marrow and blood, whereas lymphomas arise in activated B-cells that have matured and migrated to other tissues such as lymph nodes. Multiple myeloma (MM) occurs in plasma cells, the most developed type of B-cell. The American Cancer Society reports that there are about 30,000 new cases of multiple myeloma in the United States each year, with approximately 12,000 deaths. Behind lymphoma, MM is the second most common blood cancer in the US. Unlike their B-cell predecessors, plasma cells usually do not express the cell-surface proteins called CD19 and CD20, which have become standard molecular targets for treating other blood cancers like leukemia and lymphoma. For example, Roche’s Rituxan, which is widely used in treating different types of lymphoma, is an antibody that binds to cancer cells that express CD20. Additionally, the first approved CAR-T therapies—Yescarta and Kymriah—both target CD19. These CD19 based therapies would be ineffective against multiple myeloma cells because they have a different molecular architecture. There are several treatment options currently available for patients with multiple myeloma. One of the most popular drugs for treating MM is Celgene’s Revlimid (lenalidomide). Revlimid is an immunomodulatory agent that works by combining direct anti-tumor effects with indirect activation of the patient’s immune system. Other common treatment options are proteasome inhibitors like Takeda’s Velcade (bortezomib). Proteasome inhibitors have been effective in multiple myeloma because they capitalize on the behavior of plasma cells as antibody factories, targeting the breakdown of protein in myeloma cells to prevent the replication of cancer cells. More recently, Genmab’s Darzalex (daratumumab), a monoclonal antibody targeting CD38, was also approved as a new treatment for multiple myeloma. Darzalex has since emerged as an important treatment option in multiple myeloma and has worked its way up to earlier lines of therapy. Darzalex was most recently approved in May for newly diagnosed multiple myeloma patients that are ineligible for stem cell transplant. Last month, Johnson and Johnson published positive results from two Phase III studies of Darzalex in frontline therapy that could improve the standard of care in newly diagnosed patients. This drug has changed the treatment paradigm over the last 2-3 years for many patients and is a welcome new tool in the arsenal against MM. 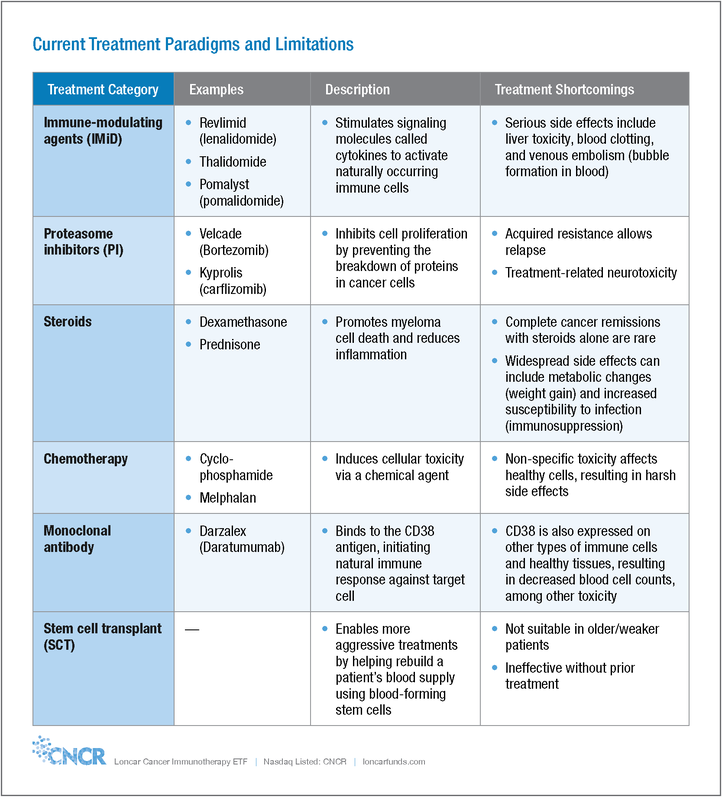 Treatment options are typically used in combination with other agents like chemotherapy or steroids to increase the effectiveness of the treatment. Younger and stronger patients may receive more aggressive treatment, followed by a stem-cell transplant. However, stem-cell transplants are becoming less common in multiple myeloma today, especially in light of newer treatment options. The problem is that despite these available treatment options, many patients still unfortunately relapse following treatment. This is where the most urgent action is required for new research. In a study published by Kumar et al. in 2017 in Leukemia journal, patients who had previously received treatment with an immunomodulatory agent, proteasome inhibitor, and chemotherapy, sadly survived on average only 13 months following progression. Thus, there is a significant unmet medical need for new therapies in patients who stop responding to treatment with existing medicines. Our focus today is on these types of patients. While patients with leukemia and lymphoma have benefitted from a range of newly approved treatments, multiple myeloma has not seen advances to the same degree. According to a record of hematology/oncology approvals by the Food and Drug Administration (FDA) there were 10 new treatments approved for leukemia subtypes in 2017, and 7 treatments approved for lymphoma. 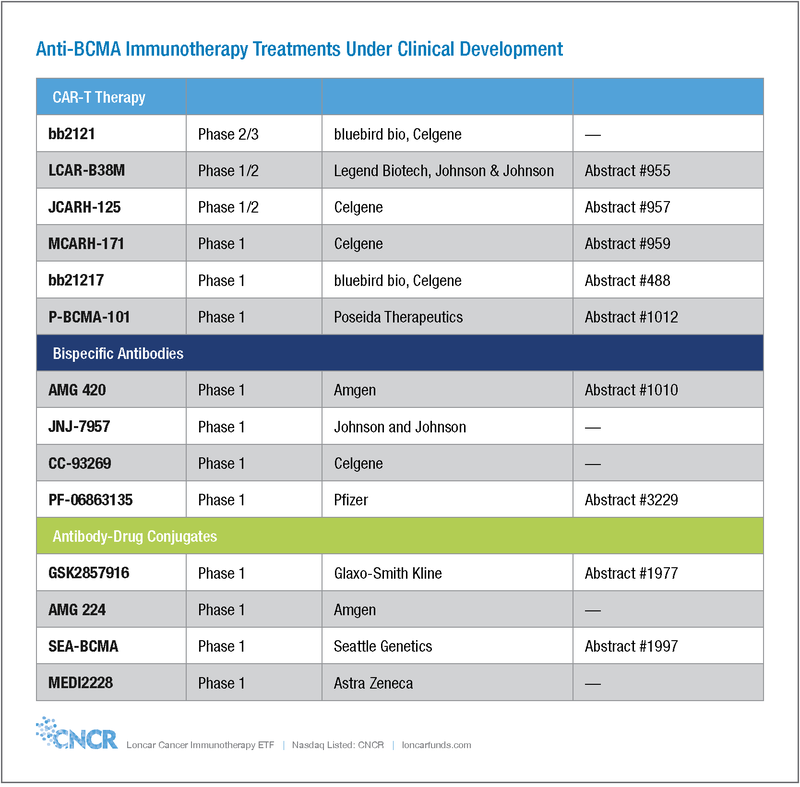 These approvals include some new, big name drugs, including CAR-T therapy (Yescarta, Kymriah), novel antibodies (Blincyto), and immune checkpoint inhibitors (Keytruda, Opdivo). 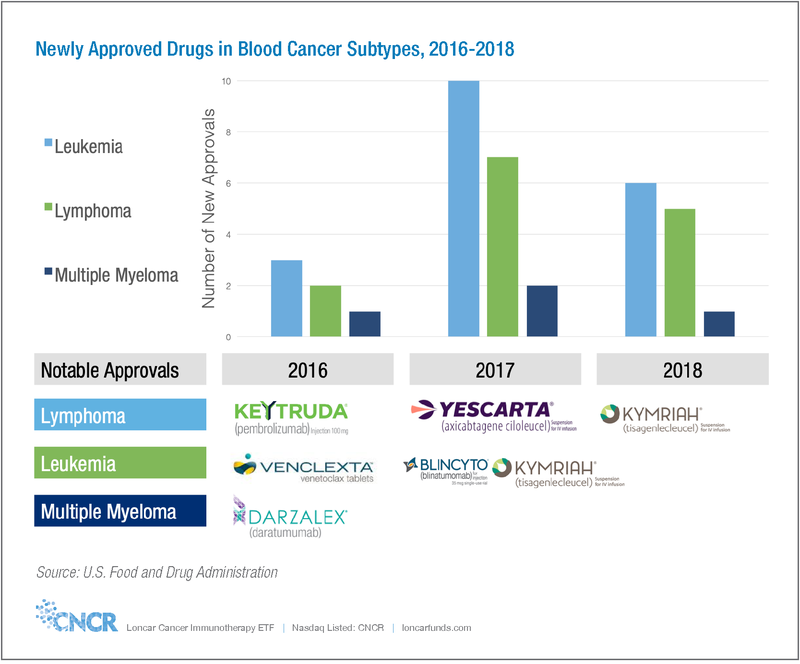 By contrast, there were no major new drug approvals for multiple myeloma in 2017, and only two notable label expansion approvals for existing drugs in new multiple myeloma subsets. However, we are optimistic that new advances might be coming in the future when we look at the flood of research that is happening in this area, especially as it relates to BCMA. The differences in the way that cancerous blood cells appear to the human immune system provide important new opportunities for novel treatment approaches. CD269, also called B-cell maturation antigen (BCMA), is another example of a protein that is displayed by cells, like CD19. BCMA is naturally involved in cellular signaling. BCMA on B-cells binds to cytokine signaling molecules called BAFF and APRIL. In healthy development, this helps B-cells survive and mature into plasma cells that secrete antibodies to maintain the immune system. However, in multiple myeloma, an increase in the amount of BCMA on cancerous cells leads to an increase in pro-growth signaling, causing cancerous cells to proliferate in excess and flood the blood with one type of antibody originating from cancerous B-cells. BCMA is unique among other antigens associated with cancer because the amount of BCMA proteins present on the surface of the cell is much higher than in healthy plasma cells. The good news is that whenever cancer cells overexpress something specifically, it might make for a promising target for new treatments. This is why there is such a strong focus on BCMA today. In a review of treatments targeting BCMA, Tai and Anderson at Dana-Farber Cancer Institute report that BCMA is the most selectively expressed protein receptor in multiple myeloma. The advantage of being selectively expressed is that the protein is rarely found in healthy tissues, meaning that treatments targeting BCMA will be mostly specific to cancer cells with the highest BCMA protein present. This is an important characteristic in minimizing potential damage to healthy cells. Other proteins present in multiple myeloma cells, such as CD56, CD138, and CD74, are frequently found in healthy tissues, making them poor targets for MM therapy. BCMA is poised to play an important role as drug developers look to utilize immunotherapeutic strategies in multiple myeloma that have been validated on cellular targets like CD19 in other types of blood cancer. BCMA is emerging as an important target in cancer immunotherapy and is featured in over 50 abstracts at the upcoming ASH meeting. There is a broad cohort of BCMA-targeting therapies under development, and several companies are hedging their bets by developing multiple treatment arms. Here, we summarize three of the approaches at the forefront of targeting BCMA: CAR-T therapy, bispecific antibodies, and antibody-drug conjugates. CAR-T therapy has gained significant traction with the recent approval of anti-CD19 CAR-T therapies Kymriah and Yescarta, which we discussed in a recent CNCR research report. A novel approach to treating MM that has shown promise in the clinic is anti-BCMA CAR-T therapies. This first became apparent at ASH in 2017. The idea is similar in principle to the approved CAR-T cell therapies in other blood cancers, but instead of CD19, researchers display an antibody fragment allowing the engineered immune cells to home in on BCMA on multiple myeloma cells. BCMA CAR-T therapies have turned heads, with close to 100% of patients treated in leading trials exhibiting a response to treatment. Bluebird bio touts bb2121 as the most advanced anti-BCMA CAR-T under development. In their most recent clinical results, announced in June at the American Society of Clinical Oncology (ASCO) annual meeting, the company reported that over 95% of patients treated with bb2121 achieved a reduction in their tumor burden, with the average responding patient seeing a treatment benefit for close to 11 months. While the response rates seen with anti-BCMA CAR-T are extremely encouraging, the modest durability seen at ASCO (many patients sadly relapsed) leaves potential room for improvement. Bluebird bio is partnered with Celgene to develop bb2121. Celgene also picked up several next generation BCMA targeting CAR-T products with their acquisition of Juno Therapeutics in January. Legend Biotech, in partnership with Johnson and Johnson, also sports an interesting anti-BCMA CAR-T product, LCAR-B38M. While initially developed by Legend in China, the partners announced in May that they had received approval from the US Food and Drug Administration (FDA) to start enrolling patients for a Phase 1b/2 trial in patients with multiple myeloma in the United States. LCAR-B38M takes a card out of the bispecific playbook (see below for more info on bispecific antibodies)—the engineered cells contain chimeric antigen receptors with two different antibody fragments, each that binds to BCMA in a slightly different way. In theory, this could provide an advantage in the way that the CAR-T cells bind to BCMA on multiple myeloma cells. Legend Biotech was also the first Chinese company to be chosen for inclusion in the press program at ASCO two years ago. The company is a subsidiary of Genscript, a publicly traded company in Hong Kong that is a holding of the China BioPharma ETF (CHNA). See all holdings of the CHNA ETF. Legend is one of four companies providing updates on their CAR-T programs at the ASH meeting. In their abstract, they report that 88% of the 57 patients responded to treatment with LCAR-B38M, and 42 achieved a complete response. Cytokine release syndrome (CRS) and neurotoxicity—prominent side effects associated with CAR-T therapies Yescarta and Kymriah—were manageable, with only 4 patients reporting severe effects from these complications. Notably, Legend also reported a median duration of response of 16 months, meaning that the average patient remained in remission for over a year. This is a promising update with regards to the durability of CAR-T therapy in multiple myeloma. Bluebird bio, Celgene, and Poseida Therapeutics all reported updated data from their anti-BCMA CAR-T programs, with response rates averaging approximately 80%. However, this data is from June due to how early it needed to be submitted to the ASH organizers so we eagerly await the release of the full data sets at the ASH meeting itself in December. Monoclonal antibodies (mAbs) have been used as biological drugs to treat cancer for many years. One standard treatment paradigm for monoclonal antibodies is to target an overactive protein receptor that is present in higher concentrations on cancer cells, such as BCMA. Treatment with a monoclonal antibody blocks important signaling interactions between a protein receptor and its target. In addition, antibodies activate an intrinsic anti-tumor mechanism of the human immune system called antibody-dependent cellular cytotoxicity (ADCC). In ADCC, binding of a therapeutic antibody to a cancer cell signals other anti-cancer immune cells like natural killer cells or certain T-cells to attack and kill that cancer cell. Antibody drug conjugates (ADCs) seek to build upon the therapeutic efficacy of antibodies by incorporating a chemotherapy agent in the antibody molecule to increase the damage done to tumor cells. An ADC is basically a molecular missile, consisting of an antibody that binds to BCMA, which is linked chemically to a toxic payload. When the antibody binds to BCMA on the surface of a multiple myeloma cell, the ADC is absorbed by the cancer cell, and the chemical payload is released, killing the cell. Antibody-based treatment is ultimately limited by the amount of antibody that can bind to target cells. But BCMA is not only present on cancer cells, it can also be found as a free protein in circulation in the patient’s blood, not associated with a cancer cell. This creates an antigen sink where an antibody based drug will get stuck, binding to free BCMA instead of targeting cancer cells. To compensate for the antigen sink, higher doses may be required, which increase the potential for treatment-related side effects. Glaxo-Smith Kline (GSK) is developing GSK857916, an antibody-drug conjugate targeting BCMA. GSK 856916 uses the same chemical linker and a similar toxic payload to Adcetris, the first clinically-approved ADC made by Seattle Genetics, which has been very successful in treating certain types of lymphoma. Last year at the 2017 ASH meeting, GSK reported a 60% response rate in the Phase 1b/II DREAMM-1 study, which included relapsed multiple myeloma patients treated with GSK857916. One other approach to engineering improved antibodies is called a bispecific antibody. Human antibodies contain a distinctive Y shape. Each fork of the Y contains a variable region that specifically binds to a target, while the base of the Y comprises a structure that is recognized by other immune cells. Because there are two variable binding regions, a standard antibody can conceivably bind to two separate molecules that display the same binding target. A bispecific antibody contains a similar structure to a standard mAb, although instead of containing two identical variable regions, a bispecific antibody is engineered such that each variable region binds to a different target. For a more detailed description of the technology behind bispecific antibodies, please read our interview with the CEO of Xencor, a leading bispecific antibody company. Similarly, a bispecific T-cell engager (BiTE) antibody is engineered with two different variable regions, but lacks some of the other structural characteristics of an antibody. As the name suggests, a BiTE antibody is designed to physically bring together cancer cells with anti-cancer T-cells. One part of the antibody binds to BCMA on multiple myeloma cells, while the other binds to a target called CD3, which is an identifying molecule on human T-cells, bringing together the immune hunter with its cancerous prey. Binding Affinity refers to the strength of an individual binding interaction between one receptor and its target. Binding Avidity refers to the aggregate strength of binding between two entities that results from multiple binding interactions. You can think of biological binding interactions as a molecular tug-o-war. Affinity is the effect of one person pulling on the rope, while avidity results from a whole team pulling together. In types of multiple myeloma where there is very little BCMA on the surface of cancer cells, the lone binding region on a bispecific antibody may have a low probability of binding to its target, particularly when the target is present at a lower concentration on a cancer cell. By contrast, an antibody-drug conjugate which has two regions that can bind to BCMA will have twice the number of potential interactions with a cancer cell. Further, a CAR-T cell with many receptors expressed on the surface of the cell will have even more potential to form a highly avid binding interaction, meaning that many protein receptors engage in a molecular tug-o-war with a cancer cell. Several companies have bispecific platforms under development targeting BCMA. Back in September, Amgen wowed the research community with results from a Phase 1 study of their BCMA bispecific AMG 420. All five of the patients treated achieved complete responses, with 4/5 testing negative for minimum residual disease (MRD), meaning that no trace of cancer cells could be detected in these patients. However, it is important to note that this drug needs to be administered via an intravenous infusion continuously around the clock for four weeks so that will likely challenge any commercial opportunity for it. Amgen acquired AMG420 along with Blincyto in 2012 with their $1.6 billion purchase of Micromet. 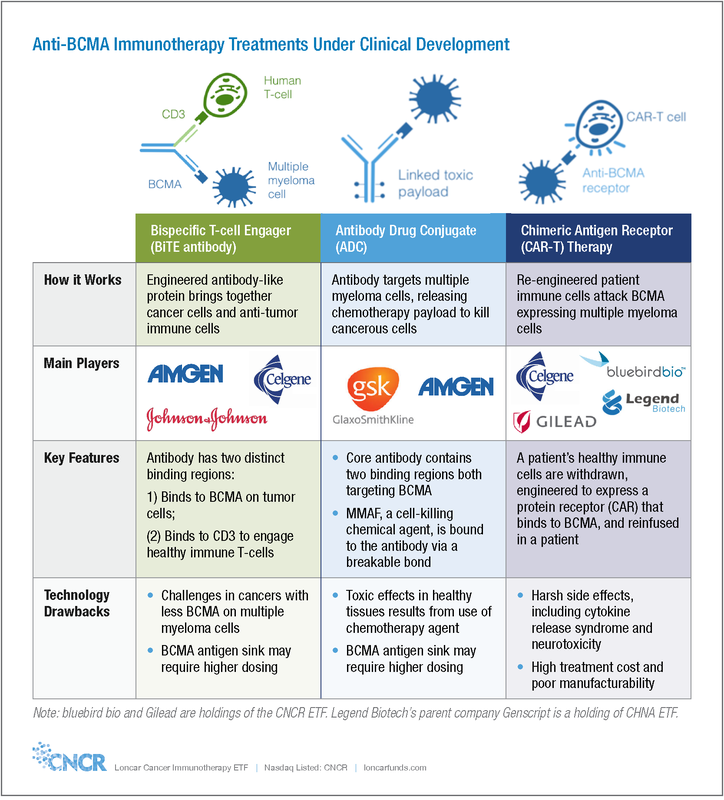 Celgene, Johnson and Johnson, and Pfizer also all have ongoing early-stage trials with bispecific antibodies targeting BCMA. Amgen reiterated their earlier results in an abstract released for AMG 420 prior to the ASH meeting, demonstrating strong response rates in the patients treated at higher dose levels. Amgen is expected to provide a more comprehensive data update in an oral presentation at ASH. It is worth mentioning that the new immunotherapy strategies highlighted here are being tested in highly relapsed/refractory patients. These are people who have received many different types of currently approved therapies, who have stopped responding to conventional treatments, and who have seen their cancer return. These patients are generally much harder to treat effectively. They often have advanced stage cancer that is resistant to a diversity of treatment options. It is therefore promising that new treatment options have achieved high response rates in early trials in this setting. In the future, clinical trials may test these emerging treatment options in patients with earlier disease, to see if they offer a greater benefit compared to current standard of care. Bluebird Bio is enrolling a phase III trial comparing bb2121 to standard triplet therapy, which includes a monoclonal antibody, an immunomodulatory drug, and a steroid. This will be one of the first head-to-head trials directly comparing an anti-BCMA product to current treatment options. One day, it is possible that therapies targeting BCMA will be considered as part of a standard first-line treatment regimen for patients newly diagnosed with multiple myeloma. Lastly, another promising aspect about BCMA is that it has potential to help diagnose cancer in the first place as well. We previously mentioned that BCMA can be found as a free protein in the blood. Patients with multiple myeloma also have more BCMA protein in their blood serum, compared with healthy patients. Dr James Berenson, founder of the Institute for Myeloma and Bone Cancer Research, has shown that plasma BCMA levels correlate with the number of cancerous plasma cells in a patient’s bone marrow, and has suggested that BCMA in the blood can be used as a novel way of diagnosing multiple myeloma and tracking a patient’s response to treatment. Unlike other types of cancer which form solid tumors and can be readily tested using physical methods, blood cancers rely on blood-based diagnostics. Recall that cancerous plasma cells in multiple myeloma still rampantly produce one type of antibody, which will vary depending on the patient. Current blood-based diagnostics for multiple myeloma measure the amount of aberrant antibody produced by cancerous plasma cells (called M protein) in the blood or urine. M protein levels take a long time to respond to changes in the number of cancerous plasma cells and can decrease over time, even without a reduction in the actual amount of cancer that a patient has. Compared to antibodies, BCMA proteins undergo rapid turnover in the blood. This means that the amount of BCMA present in the blood will change more rapidly to reflect changes to the underlying population of cancerous plasma cells, potentially providing a more accurate glimpse into the state of the disease environment. Further, not all MM patients secrete M-protein. BCMA thus provides a potential diagnostic avenue for these patients. What is Next for BCMA? BCMA has rapidly emerged as one of the most promising targets in cancer research. Accordingly, numerous biotech researchers are flocking to BCMA, bringing with them the latest in immunoengineering technology. In light of the promising early results that have been published surrounding these treatments, we are optimistic that BCMA might provide a treatment avenue to help make multiple myeloma a manageable disease for the tens of thousands of patients who are newly diagnosed each year. We will be watching closely at ASH in December to see if any of these BCMA approaches (CAR-T, antibody-drug conjugates, or bi-specific antibodies) emerge as potential best-in-class treatment options for patients. Opinions expressed are those of the author or Funds and are subject to change, are not intended to be a forecast of future events, a guarantee of future results, nor investment advice. Fund holdings and allocations are subject to change at any time and should not be considered a recommendation to buy or sell any security. Amgen, Celgene, Genmab, Glaxo-Smith Kline, Johnson & Johnson, Pfizer, Poseida, Roche, Seattle, Genetics, and Takeda are not a holding of the Fund or affiliated with the Fund.